Frostown, Houston. Image available on the Internet and included in accordance with Title 17 U.S.C. Section 107. 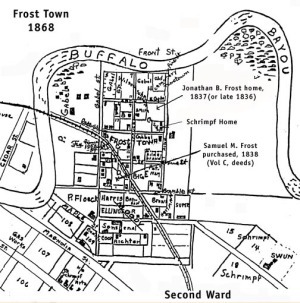 Frostown Map, 1868. Image available on the Internet and included in accordance with Title 17 U.S.C. Section 107. Early Frostown Maps. Girard, 1839 on the left. Wood, 1869 in the center. Koch, 1873 on the right. Courtesy of the Houston Archeological Society. Image available on the Internet and included in accordance with Title 17 U.S.C. Section 107. FROSTOWN, TEXAS. Frostown (Frost-Town), an early settlement in what is now the city of Houston, was named for the Frost family, who arrived in the 1830s. It was located on Buffalo Bayou in Harrisburg (now Harris) County eight miles upstream from Harrisburg and several blocks east of the conjunction of White Oak Bayou and Buffalo Bayou, west of present U.S. Highway 59. In 1822 the area was settled by the Wilkins family, Dr. James A. E. Phelps and his wife, Rosalie A. Yerby, Stephen Holston, John Austin, and others. Austin received a two-league survey in 1824 from the Spanish government under the supervision of Stephen F. Austin. The 1826 census of Austin's colony taken by the Spanish government listed about twenty inhabitants, mainly farmers and stockraisers. Between the late 1820s and the 1840s, Germans began settling in the area, and the settlement was called simultaneously Germantown and Frostown. Col. Jonathan B. (Benson) Frost of the Texas Cavalry arrived in the area with his slaves, his household, and his blacksmithing equipment after July 12, 1836. Soon he was joined by his brothers, Samuel Miles Frost (who also served three months in the Texas army) and James Coleman Frost (who requested lots to set up a sawmill). Later his mother, Rhoda Miles Frost, and his sister and brother-in-law, Mary Elizabeth (Frost) and John B. Dunn, arrived from Tennessee. In 1838 A. Girard, a retired Texas army officer, drew up a map of Houston and included the area of Frostown as a subdivision. In 1866 W. E. Wood, a civil engineer, drew up a new map of the city that showed Frostown and its cemetery and noted where families lived and locations of businesses and churches. 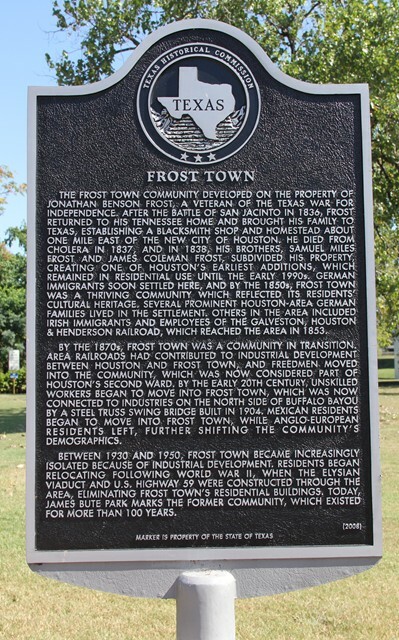 Frostown Historical Marker. Image available on the Internet and included in accordance with Title 17 U.S.C. Section 107. Frostown grew rapidly, and its businesses and institutions were among the first in the county. Several places of worship were established, including Episcopal (1838), Catholic (1841), German Methodist (1846), and Jewish (1854). The town also had Rusk School, District No. 1, and a volunteer fire department. In 1842 the fire-fighters bought their first engine, a horse-drawn barrel. The construction of the Galveston, Houston and Henderson Railroad reached town in 1853. Frostown had a slaughterhouse and meat market run by the Schrimpf family and later by the Settegast brothers, an armory, and a brewery built by the Michael and Peter Floecke families. The Frost family owned a sawmill, a store, and a blacksmith shop. By early 1854 Frostown was a thriving community, with large boats coming up the bayou, transporting loads of cotton and logs. The town experienced a decline in the 1880s, however, when the post office was closed. Frostown Cemetery, which was used until the 1880s, no longer exists; the Harris County tax assessor's Block Book shows that the site has disappeared into the bayou. In the mid-twentieth century bulldozers demolished the remaining gable-roofed cottages in the community in order to construct the East Texas Freeway section of U.S. Highway 59. Marie Phelps McAshan, A Houston Legacy: On the Corner of Main and Texas (Houston: Gulf, 1985). Handbook of Texas Online, Gladys E. Clark, "FROSTOWN, TX," accessed April 21, 2019, http://www.tshaonline.org/handbook/online/articles/hvf61.